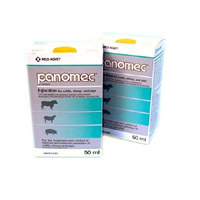 Panomec is an injectable form of the drug ivermectin, which is widely used to control parasites. Licensed for use in cattle, sheep and pigs. Please see the data sheet below for further details. Below are some recent questions we've received regarding Panomec, including answers from our team. This product is not licensed for use this way and so only your own vet is allowed to advise you to use an unlicensed medication for your animals. However I can say that Panomec is widely used in Guinea Pigs, usually as a treatment for mange. It is effective against other parasites too and appears to be very safe if used at an appropriate dose (which your vet could advise you on). It can be given orally or by injection. There are other products, such as Xeno 450, which contain the same active ingredient (ivermectin) and are recommended for use in Guinea Pigs, so you could look at that.